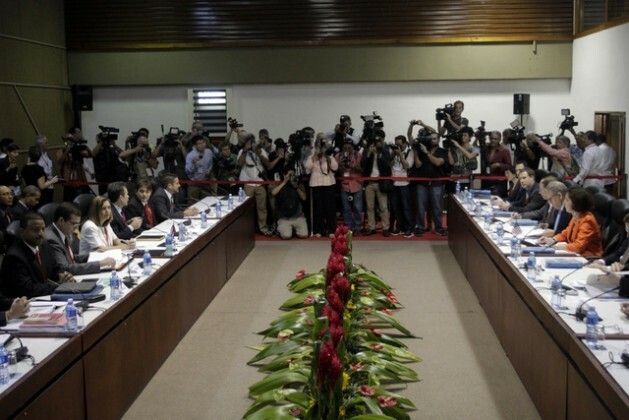 HAVANA, Jan 26 2015 (IPS) - The biggest discrepancies in the first meeting to normalise relations between Cuba and the United States, after more than half a century, were over the issue of human rights. But what stood out in the talks was a keen interest in forging ahead, in a process led by two women. 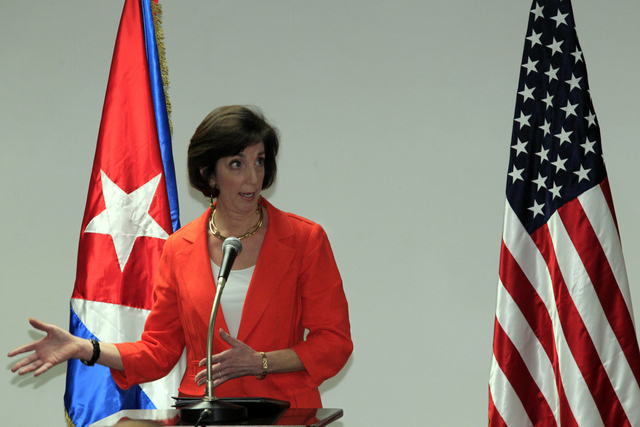 After a meeting with representatives of Cuba’s dissident groups, U.S. Assistant Secretary of State for Western Hemisphere Affairs Roberta Jacobson reiterated on Jan. 23 that the questions of democracy and human rights are crucial for her country in the bilateral talks, while stressing that there are “deep” differences with Havana on these points. But the head of the Washington delegation said these discrepancies would not be an obstacle in the negotiations for restoring diplomatic ties – a goal that was announced simultaneously by Presidents Barack Obama and Raúl Castro on Dec. 17. In her statement to the media after her two-day official visit to Havana, Jacobson added that her country’s new policy towards Cuba is aimed at greater openness with more rights and freedoms. Nor does independent journalist Miriam Leiva, founder of the opposition group Ladies in White, believe the U.S. focus on defending human rights and supporting dissidents will be a hurdle. “The Cuban government knew that, and they sat down to talk regardless,” she remarked to IPS. In her view, the important thing is for the normalisation of ties to open up a direct channel of communication between the two governments. “This is a new phase marked by challenges, but also full of hope and opportunities for the people. Of course it’s not going to be easy, and the road ahead is long,” she added. The Cuban authorities have consistently referred to opposition groups as “mercenaries” in the pay of the aggressive U.S. policy towards Cuba. Nor are they happy when U.S. visitors to Cuba meet with opponents of the government. And they are intolerant of the relationship between dissidents and the U.S. Interests Section in Havana, which is to be turned into the new embassy as part of the process that got underway with the first round of talks in the convention centre in the Cuban capital. Jacobson and her Cuban counterpart, Josefina Vidal, the Foreign Ministry’s chief diplomat for U.S. affairs, addressed the issue of human rights during the talks on Thursday Jan. 22. In the 1990s and early this century, the question of human rights triggered harsh verbal confrontations between Havana and Washington in the United Nations Commission on Human Rights, and since 2006 in the U.N. Human Rights Council. Havana complained that the U.S. used the issue as part of its “anti-Cuba” policy. Vidal said she suggested to Jacobson that they hold a specific expert-level dialogue at a date to be agreed, to discuss their views of democracy and human rights. In his view, during the process that led to the 1959 triumph of the revolution, which was later declared “socialist,” there was a “struggle between a vision that put a priority on so-called individual rights to the unnecessary detriment of social rights and inequality,” and one that put the priority on social and collective rights. As a result, in this Caribbean island nation what has prevailed up to now is “a conception [of human rights] that favours equality and social rights at the expense of certain freedoms, and of this country’s relations with important countries,” he said. Veiga said Cubans must complete the effort to find a balance between individual rights and social equality. It is important to discuss this issue “for the development of Cuba’s political system and the consolidation of our civil society,” he argued. The two delegations also addressed possibilities of cooperation in the areas of telecommunications, national security, international relations, people smuggling, care for the environment, responding to oil spills, the fight against drugs and terrorism, water resources, global health, and a joint response to the ebola epidemic in West Africa, among others. In the first part of the meeting, the two sides analysed the practical steps to be taken for the opening up of embassies, which will basically follow the Vienna Convention on Diplomatic Relations in effect since 1964. The date for the next round of talks was not announced. The meeting was preceded, on Wednesday Jan. 21, by a round of follow-up talks on the migration accords reached by the two countries in 1994 and 1995. Most Cubans are sceptical and even incredulous about the surprising decision to “make friends” with the United States.